LAS VEGAS, NV--(Marketwire - Sep 6, 2012) - In what may be a precedent-setting occurrence in the gaming industry, the top jackpots on Aristocrat's linked Tarzan® Lord Of The Jungle™ and Mission: Impossible™ slots have hit four times in just three days, paying out more than $1.1 million! The top jackpot on Tarzan Lord Of The Jungle hit first for $356,051.40 at Kiowa Casino in Devol, Okla., then for $252,289.91 at Potawatomi Casino in Milwaukee, Wisc., and then for $250,190.10 at Kewadin Casino in Sault Ste. Marie, Mich. The top jackpot on Mission: Impossible hit for $250,660.24 at Mohegan Sun Casino of the Earth in Uncasville, Conn. The top jackpot has been hit 21 times since Tarzan Lord Of The Jungle swung onto casino floors last year, and has paid out more than $6.95 million in top jackpots. "These jackpots are absolutely incredible and tell us one thing: players love to play our Tarzan Lord Of The Jungle and Mission: Impossible slots. With frequent jackpots like these, these games are clearly the must-play games for players, and with their incredible performance, they are must-have games for operators," said Aristocrat VP of Gaming Operations Dallas Orchard. Tarzan Lord Of The Jungle has been voted Best Video Slot, Best Penny Slot, Luckiest Slot, Best Video Slot Bonus Round, Best Slot Graphics and a top Progressive Slot by players in the Southern California Gaming Guide "Best Slots 2012 Awards," and was ranked as one of the top performing lease titles in the marketplace in the Roth-Fantini Q2 2012 Slot Survey. Aristocrat's Mission: Impossible video slot game is every bit as fun and entertaining as the film that inspired it. Mission: Impossible is a daring adventure from the first spin with players searching for the wide area progressive jackpot and its $250,000.00 top award. There are also three local area progressive jackpots and six pulse-pounding bonus features. 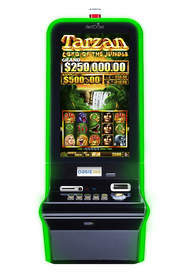 The Tarzan Lord Of The Jungle and Mission: Impossible grand jackpots are linked, meaning there is a greater potential for more frequent grand jackpot hits. Mission: Impossible © 2011 Paramount Pictures. All Rights Reserved. TARZAN® and TARZAN YELL® are registered trademarks of EDGAR RICE BURROUGHS, INC. and Used by Permission. © 2011 Edgar Rice Burroughs, Inc. All Rights Reserved.